....Good heavens..., what a good record this is. 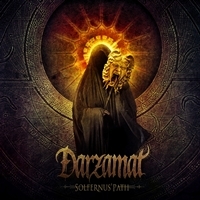 The songs have influences of several different styles of metal, but instead of leading to nothing Darzamat molts them into good written tracks. Above that they succeed in creating a style of their own and that is very difficult nowadays. This Polish band can have a great future with the right support. Darzamat combines clean female vocals with male grunting ones. Both are done well and make the music very exciting. Musically the band combines black metal with symphonic progressive parts and gothic elements. If you can imagine a progressive mix of Cradle of Filth with Dimmu Borgir, Epica, and Nightwish you should an idea. The album is a concept story, is produced by Jonas Kjellgren (Scar Symmetry) and has a guest appearance of Andy La Rocque (is there a record without him?). With every spin the album gets better, so if the coin doesn't fall with the first listening; take the time and listen again. Highly recommended to fans of Cradle, Dimmu, Epica and all other open-minded metal heads. Killer album! !